Jerry Leroy Goff (born April 12, 1964) is a former Major League Baseball player. Primarily a catcher, Goff was listed at 6 ft 3 in (1.91 m) and 207 pounds. He batted left and threw right. Goff was drafted twice as a player at San Rafael High School, by the Oakland Athletics in 1983 and the New York Yankees in 1984, but elected instead to attend the University of California, Berkeley. He is 9th in career home runs for Cal (29; tied with Josh Satin). He was drafted in the third round of the 1986 Major League Baseball draft, 63rd overall, by the Seattle Mariners. He agreed to sign and went professional. Goff struggled with a low batting average while advancing through Seattle's minor league system, but also showed good power. The Montreal Expos acquired him from Seattle in exchange for Pat Pacillo on February 27, 1990, and he made his Major League Baseball debut with them on May 15 of that year. He returned to the minors for 1991, but spent parts of the next six years as a backup catcher for the Expos, Pittsburgh Pirates, and Houston Astros. On May 12, 1996, Goff allowed six passed balls in a single game: two each in the first, third, and fourth innings. This tied him with catchers Rube Vickers and Geno Petralli for the single-game record. Goff had two hits in the game, including a home run, but his miscues led to five unearned runs for the Expos, who went on to win the game 8–7. The Astros sent Goff to Triple-A on May 17, and he never appeared in another big league game. He appeared in 90 games in his major league career, batting .215 with a .320 on-base percentage and a .336 slugging percentage in 214 at bats. Goff continued to play professional baseball after his days in the Major Leagues were finished. 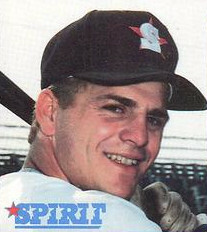 While with the independent Amarillo Dillas, Goff was a member of the Texas–Louisiana League All-Star team in 1997. The last healthy position player remaining on the roster, Goff entered the game as a pinch hitter in the ninth inning and hit a game-winning double. Working as a firefighter in 2001, Goff was still playing semi-pro baseball for the Novato Knicks, an exhibition team based in Marin County, California. Goff lives in Novato, California with his wife and two children, Lauren and Jared, who is the starting quarterback for the Los Angeles Rams and was the number 1 overall draft pick in the 2016 NFL Draft. ^ "Josh Satin Named First-Team All-American in Baseball America". Calbears.com. June 12, 2008. Archived from the original on June 9, 2012. Retrieved September 3, 2011. ^ Doyle, Jim (June 24, 2011). "For the love of the game / There's no fame, no fortune and most times, not many spectators. But the Novato Knicks are still playing, because they love baseball". The San Francisco Chronicle. This page was last edited on 4 February 2019, at 03:37 (UTC).